Romeo and Juliet is a tragedy written by William Shakespeare about two star crossed lovers whose demise reconciles the family feud between the Capulets and Montagues. Named after the classic play, The Romeo y Julieta marque was established in 1875 by Inocencio Alvarez and Manin Garcia. The brand is the Spanish name for Shakespeare's famous tragedy. Romeo y Julieta Reserva Real marries a select, balanced blend of Dominican longleaf fillers and Nicaraguan ligeros completed with a golden Ecuadorian Connecticut Shade seed wrapper making this the most approachable Romeo y Julieta cigar in their lineup. Slightly oily, Reserva Real is incredibly aromatic and flavorful with notes of leather, spice and a woodsy finish. Te Amo means “I love you in Spanish” so it is only fitting this cigar would end up on our list of the top Valentine’s Day cigars. Te-Amo Revolution Robusto Ovalado is a beautiful oval shaped boutique style cigar. The rich earthy flavors are sure to appeal to the modern cigar enthusiast. Te-Amo was ranked #13 Cigar in 2014 by Cigar Aficionado Magazine. Unfortunately, this cigar was discontinued, so if you can find them, buy ‘em! Eileen’s Dream by CAO is an infused cigar with a blend of mild Dominican tobaccos and an exotic, spicy African Cameroon wrapper, which is then laced with Irish whiskey, coconut milk, vanilla, cream, and white chocolate truffles. It is the perfect cigarillo for beginners and aromatic cigar lovers. Perdomo Reserve 10th Anniversary Champagne offers rich layers of cream and sweet honey with a mild-bodied profile. Pair this ultra-premium cigar with a flute of Moet & Chandon and your significant other. The Perdomo Champagne line is smooth and crisp, with a richness that ends bright and clean on the palate. Moet & Chandon's subtle toasty character of apple and honey imparts harmony when paired with Perdomo Reserve 10th Anniversary Champagne. ACID Krush Classic Red Cameroon are petite cigars handcrafted with an African Cameroon wrapper blanketing the finest long filler Nicaraguan tobaccos infused with secret essential oils, herbs, and botanicals. If your Valentine has a crush on infused cigars, they will love the dark, spicy, and earthy aromas of ACID Krush Red Cameroon cigarillos. My Father Flor de las Antillas Toro was named Cigar Aficionado’s Cigar of the Year in 2012 with an impressive 96 rating. An homage to Don Jose Pepin Garcia’s homeland, Cuba, Flor de las Antillas- “The Flower of the Antilles “-is the first boxed-pressed line from My Father. This true medium-bodied beauty is a blend of pure Nicaraguan tobaccos with a Nicaraguan Sun Grown wrapper. Notes of white pepper, nutmeg, cedar, and cocoa tickle the senses. The Oliva Serie V Melanio entails an Ecuadorian-grown Sumatra wrapper and Oliva traditional Cuban-style long leaf ligero from the Nicaraguan regions of Estelí and Condega with emphasis on Jalapa Valley tobaccos. Carefully aged, the prized premium Jalapa leaves are meticulously aged, achieving a more unique flavor and aroma than other tobaccos. The full-bodied Serie V Melanio is powerful with touches of black pepper, yeasty sourdough bread, and dark bitter chocolate with hints of coffee and cream. The Oliva Serie V will stimulate your significant other’s senses. Cigar accessories are an excellent option to make your loved one’s cigar-smoking experience better. You can choose to present high-quality lighters, humidors, cutters, cases, travel supplies, and other accessories from El Cigar Shop. So, this Valentine’s Day add some romance to your relationship by showing your true love how much you care about their smoking pleasure. 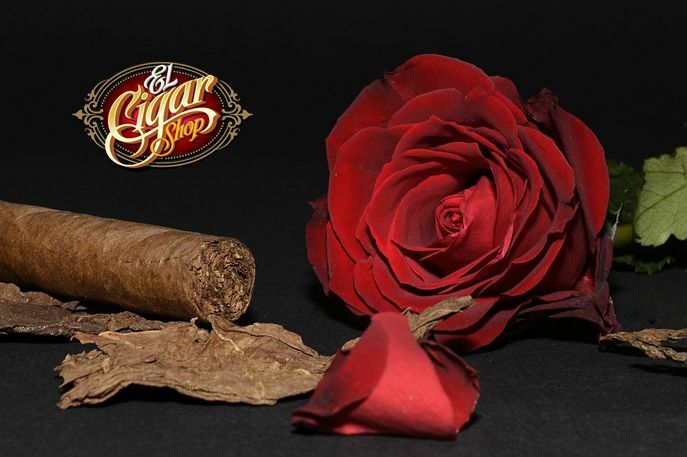 Surprise your spouse with El Cigar Shop’s premium brand cigars; Valentine’s Day, or any other day you are feeling romantic, for that matter!